By Diana T. Kurylko . Published on February 11, 2013. The "BMW Genius Everywhere" program is slated to go nationwide in about a year, with specially trained employees -- many of them college students -- patrolling dealerships with iPads in hand. The BMW "geniuses" will be available to inform shoppers about vehicles and features, but they will not sell cars. The approach is similar to the Genius Bar program in every Apple outlet -- product explainers and troubleshooters who answer questions and give free technical support. Cadillac and Lexus have similar programs in their U.S. dealerships. BMW wants a "critical mass" of Geniuses in time for the rollout of the i3 electric car that will reach U.S. dealerships in early 2014, said Peter Miles, BMW of North America's VP-operations. The program is being launched across Europe after a trial at several large dealership groups in the U.K. last year. A pilot program in the U.S. will begin later this year in several stores and will be rolled out nationwide by early 2014. "The salesman has a complicated job," said Ian Robertson, BMW board member for sales and marketing. "He has to understand product, he has to be trained and he has to understand financial services. And honestly, it has probably gotten a little too broad. One of the things we considered very carefully: Can we break the process up into bite-size chunks?" 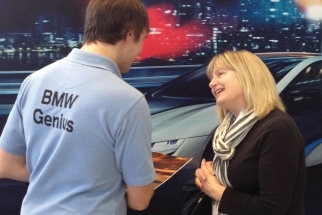 In Europe, the employees wear a white polo shirt that says "BMW Genius." They are paid a salary, not a commission on sales. "He is not in the pressured environment to sell a car," Mr. Robertson said. "If the buyer says "I want to take the next step,' he is handled over to a salesman." For the pilot in the U.S., BMW aims to attract "smart, car-savvy" college students "who want flexible hours to work in our dealerships as a local source of Genius labor," said Mr. Miles. He says students are able to work evening and weekend hours when dealerships are busiest. Existing employees also could be used. For example, Mr. Miles said, a vehicle-delivery specialist could be trained to be a showroom Genius. He said the specific guidelines have not been set but that every dealership will be required to have a Genius. Mr. Robertson said the program works better when vehicles are custom-ordered, which could be an issue in the U.S. In this country, far more vehicles are purchased off the lot than in Europe. In the U.K., dealers have found that buyers who use a Genius usually equip their vehicles better, Mr. Robertson said. Initially, he said European dealers were concerned with what they saw as an added cost. "But when they understand it and see what results are possible, it is a minor cost," he said. "We have quite a few companies say: "I am not going to have only one but three,' because they see what is possible and they see their satisfaction ratings going up." Last year, Lexus established delivery and technology specialists at its dealerships -- employees who took over tasks normally assigned to a salesman or service-drive adviser. Lexus adapted a program from one dealer who also was inspired by the Apple Store Genius Bar. John Iacono, a New York dealer who chairs the Lexus National Dealer Advisory Council, said the position has provided big customer-service rewards for the brand. "We've had customers tell us they would never buy any other brand because of the delivery specialists, because of their patience, professionalism and knowledge of the vehicle," he said. To get the specialists up to speed last year, Lexus hosted training sessions during the past four months in nine cities, training 2,400 representatives. Last year, General Motors also took a page from the Genius Bar program by requiring Cadillac dealers to designate two employees as certified CUE specialists -- one in sales, the other in service -- as experts to walk customers through the system known as the Cadillac User Experience, or CUE. BMW's Genius program is part of an enlarged package of video and audio information at BMW of North America. Mr. Miles said the package will include vehicle and feature explanations on the BMW USA website, on special iPad and iPhone applications and via the BMW Assist call button inside every vehicle. "The strategy is to make our knowledge about our brand more interesting and more accessible to the consumer," he said. The videos will be rolled out starting in the third or fourth quarter and will be available on BMWUSA.com. They also will be used for dealer internet training, Mr. Miles said. The iPhone and iPad apps will offer the same information. And a customer using BMW Assist in a vehicle will get the information from a real person. Mr. Miles said the feature will likely be available in 2014. "We engineer a lot of things into the car that are difficult to explain, that makes us a special brand," he said. "We need to leverage the engineering that goes into the car more effectively so that we are not just selling a car based on price." Ms. Kurkyo is writer for Automotive News. AN's Mark Rechtin and Mike Colias also contributed to this report.